Witnesses record avalanche in Wood River Valley. The avalanche that damaged the two homes is still causing concerns. Blaine County Commissioner told 6 On Your Side the road is still closed about a mile west of the Warm Springs Lodge. There are people in homes on the other side of the massive slide, but the county has been in touch with them. Supplies can be delivered to those people if need be. The slide occurred in an area damaged by forest fires. 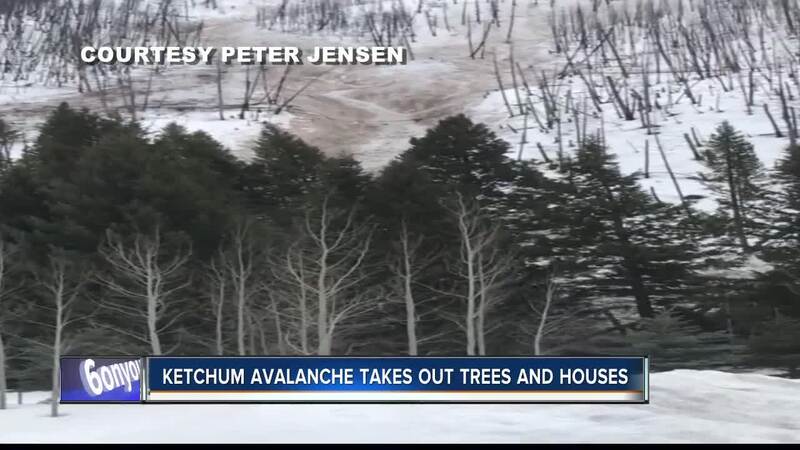 An avalanche severely damaged two homes in Ketchum Monday afternoon. Witnesses tell 6 On Your Side it happened around 1:00 p.m. at Warm Springs and Whipsaw Lane. Victoria Jensen says it started as a gentle roar, then picked up momentum and took out a big stretch of live evergreen trees. "Only the two house in the path stopped the avalanche but the homes are pushed off their foundations and tipped over like toy buildings," Jensen said. Blaine County officials have closed Warm Springs Road to non-residents at Penny Lake.